There are many reasons why digestive problems arise. Most commonly, it is due to poor diet and lifestyle choices. However, some digestive issues can be caused by internal fungal, bacterial or viral infections. Severe digestive issues such as gastritis can be extremely painful and not always easy to clear up without seeing a medical professional. Apple cider vinegar is a wonderful natural remedy that is used in the treatment of gastritis and many other digestive issues. Made by fermenting alcoholic cider for a second time, this process converts the sugars found in alcohol into high quality vinegar. This age old tonic contains a myriad of miraculous health benefits due to the natural acids and powerful enzymes found within. What's in ACV that can aid Digestion? Natural acids - Apple cider vinegar contains two types of naturally occurring acids; Malic acid and acetic acid. It is these acids that are thought to provide apple cider vinegar with its antibacterial and anti-fungal properties. Vitamins - Tired of taking vitamin pills every morning? Why not switch to an apple cider vinegar and honey drink to kick start your day. Apple cider vinegar contains vitamins B1, B2, and B6; biotin, Folic acid, niacin, Pantothenic acid and Vitamin C.
Pectin - Pectin is a form of soluble fibre found in apples and citrus fruits that may help to protect your bodies from certain types of disease. Pectin is great at combating diarrhoea. According to "The New Healing Herbs," pectin works with natural intestinal bacteria (good bacteria) which turn the fibre into a soothing coating for irritated intestinal walls. Minerals - Including minerals in your diet is important for a healthy digestive system. Minerals also help us to build strong, healthy teeth and bones, improve nerve function and even help us turn the food we eat into energy. Apple cider vinegar contains: sodium, phosphorous, potassium, calcium, iron and magnesium. 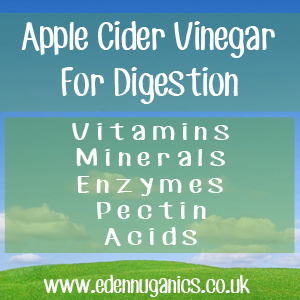 Enzymes - The digestive enzymes found in apple cider vinegar help to break down our food as well as keep your body at a neutral or slightly alkaline pH level; perfect for optimal health. How often should I drink ACV? There are no official guidelines when it comes to dosage but around two or three tablespoons added to an eight ounce glass of water per day is one of the most common ways of taking this health tonic. There are many different types of apple cider vinegar available and sometimes it can be hard to know which one is the right one. When shopping, it is best to look for bottles that have some floating sediment. This sediment is known as the mother and holds many of the healing properties of this natural remedy. In addition, look out for words like raw, unfiltered and unpasteurized on the bottle. When treating digestive issues, the best method is to drink a small amount of apple cider vinegar before each meal. Combine 5 tablespoons of apple cider vinegar with 16 ounces of water. Add the mixture to an empty plastic bottle. This can now be drunk before each meal throughout your day. Store the bottle in the refrigerator in between meals if possible. Each bottle should last two days. Can apple cider vinegar improve digestion?